Listening for the spark, I was ready when it came. We stopped everything and came over for a quick conversation and HG repeated his thought. As I held up the lights, more comments came and this was my chance to teach French oral language structures and vocabulary for mathematical reasoning. 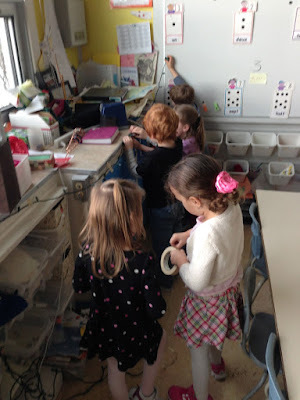 As students returned to their activities, some stayed to draw patterns using the lights as examples and to count the bundles of lights that our school is collecting to recycle in order to recover the copper inside. At the end of the day, we gathered around the smart board to ask questions about what we could measure, how to measure accurately and how to make an estimation before measuring. Students divided into groups and drew their estimation first. Today, rather than artists or scientists, mathematicians would draw their guess in their journals before beginning to measure together. We thought that we could measure the length of the windows and collaborated peacefully to secure the lights along the length of the shelf below the windows. 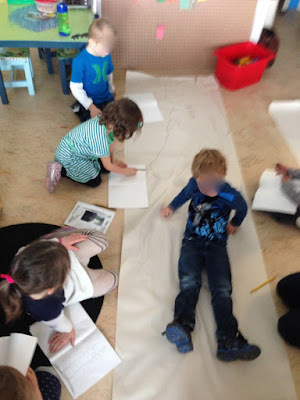 Since we were sure a string of lights was longer than one student, we wondered if a string of lights would be longer than three students together.